Actually I haven't seen the movie yet. Has anyone else? Does anyone actually read this post or do you just watch the video?! Whatever! Anyway, let me tell you why this week is going to be awesome. Secret Wars #5 is out. And that means that the "tarnished version of Doctor Doom" all of you experienced in theatres is going to be replaced by the sparkling ruthless God-Doom, ruler of Battleworld! Praise Doom! So let's go over my top five picks of the week and you can go back to picking your belly button lint. So check this out. In this comics, being "beautiful" (i.e. perfect skin, great hair, no fat, etc.) is an STD. So basically people start screwing each other over (kind of?) to become beautiful. Crazy concept right? I mean, what could possibly be terrible about an STD that you might have your entire life as long as you are beautiful and perfect? Well, an unmentioned side effect of having this "disease" is that people start dying horrific deaths. It's terrible. Phonogram: The Immaterial Girl #1 The dream team is back with their first comic. Kieron Gillen (writer-god) and Jamie McKelvie (artist-god) return to 10 year old story Phonogram, which is about a world where music is magic (and magical)! 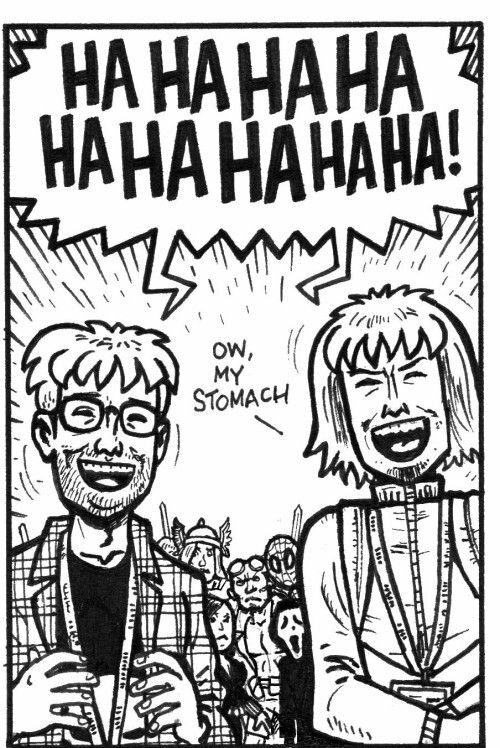 The Eltingville Club was founded by 4 friends for the purpose of all things geek-y. Movies, video games, comics, you name it, they love/hate it! But lately tension has been rising between these four hormonal boys, and now, the Eltingville Club is no more! Maybe San Diego Comic Con will help mend some old wounds? Squirrel Girl is literally the best super hero in the universe. She's beaten Thanos, Wolverine, and even Doctor Doom at one point. Sure, being able to talk to squirrels/ having the abilities of squirrels sounds and probably is really cheesy, but she makes it work for her! So she has this brand new series and in her 8th issue she is teaming up with Thor to take on the Norse Squirrel God. So remember the variant covers that came out last year for DC? Well, they were so popular they made an entire comic about them! It's the 1940s and the US is in the middle of WW2. The ladies are at home, holding down the fort, but the troops need a little help... So the super heroines at home are going to fight overseas! See these new versions of Batwoman, Wonder Woman, Super Girl and even Amanda Waller (Suicide Squad wrangler) kick some major booty! And for a bonus one.. So far, God-Doom has killed Cyclops AND his "friend" Stephen Strange. Now Doomgard mourns the loss if Strange but people are beginning to question... Who really killed Stephen Strange? And why did Doom allow them to live? So yeah. There's all of that. Check out this link for the full scoop on what is coming out this week and i will see you next week to talk about Martian Manhunter #3, the new TMNT series and much much more!